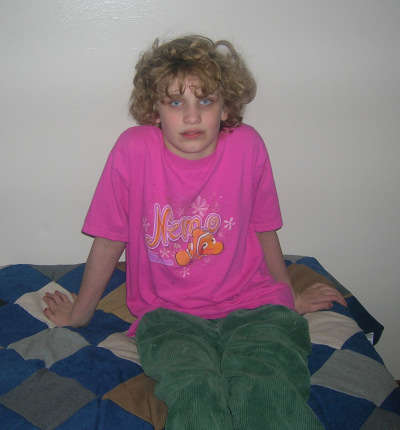 This post is really the third of a series I have written about what we went through in placing our autistic daughter, Rachel, in a residential setting. There first two posts in this series are: A Note From the Edge of the World and Life like a String Pulled Taunt. You can read all that I have written on autism here. Rachel checks our her new room at her house. It was a new school year and a new school. Rachel was starting middle school. She was a sixth grader. But the transition, as most transitions with Rachel, was rocky. Her classroom was in a big middle school, quite different from the small neighborhood elementary school. Her teachers were having difficulties with her acting out in class. By the beginning of November it was apparent that this particular placement wouldn’t work for her. We switched to a different program, one designed for children and teens with developmental disabilities coupled with behavioral issues. We had settled Rachel into her new class. She was having a little bit of a hard time, but this transition was a bit easier. Her behaviors were still highly volatile. If she was very happy she would act out, if she was upset she would act out, just about anything. She was heading into full blown puberty. All the physical changes were starting to take place and the hormones were flowing. The mood swings, the temperament changes were there just like they would be for any child her age, but with Rachel being unable to express herself like a normal girl the frustration was multiplied. At home we knew that it was only a matter of time before something happened. More and more I was answering questions from my other children about why Rachel was mean, why she was hurtful, why it was ok for her to hit or pinch or kick but not ok for anyone else. Driving Rachel anywhere alone was risky. She had learned that she could get a big reaction by attacking the driver. She had also started hurting herself on occasion. One afternoon in early November she became very agitated in the car and began banging her head back into the seat she managed to pop her jaw. She instantly stopped her tantrum and began crying. When we got home I took her to the pediatrician who looked her over and said that she would be fine, just a little sore. But we were all concerned. Life was never absolutely normal for us, but it wasn’t all a trip through the third level of hell either. Days would pass where nothing in particular happened. Rachel was more verbal than she had ever been before. She began to show a real interest in words and would have me sit and write words out for her, “cat”, “house” and she love having the names of the family on her lists. “Joshua”, “Hannah”, she liked to have her nails polished and watch TV with Ashley. She loved to have her hair washed and brushed. We were all excited with baby Sarah on the way. The children were looking forward to Christmas. But, as we knew would eventually happen Rachel crossed the line too far. She was upset in the kitchen, ran into the living room and before I could catch up with her she grabbed Christopher and bit him in the upper arm. It was bad, it hadn’t broken the skin, but that was more luck than anything, it left a huge bruise. We took Christopher to our doctor and she looked at me and said “If this had been you or Kyle I would be on the phone to child protective services.” It was a nightmare. We had no option left; we had to make the call. We called our social worker Kim, we told her that we were going to have to go for a crisis placement. Now you might remember that almost a year before we were told that crisis placement meant no choice, 24 hours or less and the child was out of the home with other frightening possibilities on top of that. But the second we actually made the call the scenario was different. I am not sure what happened. The state didn’t place Rachel in a crisis placement, but they did start looking for a out-of-home placement for her. We were told it could take a few days or a few months but probably about three weeks. It took almost two months to find a placement that would work. The options broke down into two main categories: foster-care or a residential group home. We were very nervous about the foster home option. One of the things we hoped for Rachel was more structure than a normal home could naturally provide and her elopement issues and unpredictability worried us in a home setting. Finally Kim called very excited. A place had opened up in a group home for teens, in Portland, they would be able to meet her needs, and Rachel would be close to home. It looked like a great fit. We visited the home, talked to the staff and the managing company staff, filled out more and more paper work. Everything worked out. The week after Sarah was born Rachel moved in to her house. It is a tidy ranch in a good neighborhood; the back yard is surrounded by a tall cedar fence and Rachel has her own room. It is home to five teens when Rachel moved in she was the youngest, and one of two girls. Her bedroom was painted pink, with Princess Stickers on the walls. We had several meetings where plans were made for Rachel’s care and happiness. The things she liked and the things she didn’t were taken into consideration. Each week her activates are planned, she can go bowling, shopping, even horseback riding. Support staff comes with her to enable her to manage these things. At home we have found that not being solely responsible for Rachel twenty-four hours a day seven days a week, week in and week out had allowed us to be more focused on Rachel when she is home. We aren’t’ constantly worn down. We have been able to come out of the “bunker” mentality and live. But it has been a slow process. Dr Turner told us that it would take at least a year for us to decompress as a family. He said at first we wouldn’t change how we lived because those habits that we had adopted to deal with Rachel were pretty entrenched, then we would feel some amount of guilt. We wouldn’t do things as a family and have fun because it would feel wrong not to have Rachel with us even though those things would have been unmanageable with her, like camping or going on vacation. Finally we would adjust to it and find balance. We also found that we have gone through phases of adjustment with seeing Rachel. At first we were there frequently and brought her home almost every weekend. For a while it seemed like we didn’t see her enough. But now we have found a balance. We try to make sure she is home every other weekend. At first the transitions on the weekend were very hard but now things are easier. Rachel loves coming home, but is happy to go back to her house. The placement has been good for Rachel, good for the other children. It isn’t perfect. There have been small issues with the group home staff from time to time. For a while a big thing was Rachel’s hair, which is naturally full and curly. Rachel has always loved having it brushed and washed, but the house staff would have a horrible time with it and would let it go and it would get tangled horribly. But this issue was addressed and worked out. Emotionally it was a difficult adjustment. I cried when I took the locks off the kitchen cupboard, but being able to leave the doors open for the first time in the summer was like a dream come true. Christopher had a very difficult time when Rachel first left. He blamed himself. The younger children were in ways glad to see her go, but now they look forward to Rachey days. Rachel had a bit of a hard time the first few weeks. She ran away from the house or staff a few times, but she soon adjusted. I look at it almost like she is at boarding school. We always knew that Rachel would one day be in a group home setting. We hoped that we would be able to place her as a late teen or early twenty. My first husband, Rachel’s father, worked in a group home for adults with developmental disabilities. He had seen how difficult it was for those adults who came in late, when their parents died or were no longer able to care for them. They had such a difficult time compared to those who came in as young adults. We didn’t want to stifle Rachel. We wanted her to be able to leave our home and become as independent an adult as possible. She deserves her own life, her own space and things and friends. We just didn’t expect to have to be doing that at 12 or 13. Fabulous post, Darcee. Thank you for sharing this very personal journey. I am glad to hear things are working out for all of you, and will pray for your continuing peace and the developing situation. I do agree that placement was probably easier for Rachel as a preteen than it would have been as an adult. Adult placement involves so much trauma (even for so-called ‘normal’ people, deaths in the family and moving house are statistically two of the three most traumatic life experiences) and not having to experience the placement as a result of a massive trauma (a parent’s death, or worse, a dramatic result of her own behavior) is almost certainly so much better for her, even if harder on you. « Worth a New Keyboard. You are currently reading The Rest of the Story at Simply Catholic.